Edgar Degas, like his friend Edouard Manet (1832-83), was a classicist in Impressionist clothes. His training at the Ecole des Beaux-Arts and his frequent study of Old Masters in the Louvre Museum gave him a taste and a talent for figure painting, which he refined in a wide range of ballet dancers, racehorses, female nudes and pictures of working women. These figurative works alone cemented Degas' reputation as one of the best genre painters of the 19th century. His belief in classicism, along with his aversion to spontaneous plein air painting - one of the fundamental characteristics of Impressionism - distinguishes him from other members of the Impressionist group. Even so, he can still be ranked among the Impressionists, because of his taste for modern subjects, his loose brushwork, and his constant quest to capture the fleeting moment - albeit through careful observation and precise paintwork in the studio, of which Women Ironing is a perfect example. In addition, Degas participated in 7 out of 8 of the Impressionist Exhibitions in Paris, between 1874 and 1886. See also: Impressionist Painters: Biographies (c.1840-1920). NOTE: Important works by Degas include: The Bellelli Family (1858-67), Race Horses in front of the Stands (1866-8), The Ballet Class (1871-4), Absinthe (1876), Portraits at the Bourse (1879) and Woman Combing Her Hair (1890). 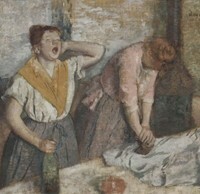 Woman Ironing (also known as The Laundresses or Les Repasseuses) in the Musee d'Orsay is one of a series of four variations of this picture - with its two washerwomen, one yawning, the other ironing - which is part of a larger series of women in laundries that Degas began in 1869. Over the next 25 years or so, he continued to exploit this theme which he succeeded in varying by changing the pose, the setting, and above all the lighting (the play of light), which he diversified as much as possible by means of artificial illumination, transparencies, reflections from the washing lying flat or drying on cords from the ceiling. Degas' treatment of this theme reflects the realism that was the vogue in literature at the time, in books such as Manette Salomon (1867), by the Goncourt brothers (1867), and above all L'Assommoir (1877) by Emile Zola, which describes in detail the laundry belonging to Gervaise, where "big Clemence was ironing her thirty-fifth man's shirt". See also Millet's genre paintings of rural workers, including: The Gleaners (1857) and the Man with a Hoe (1862). For more, see: Realism to Impressionism (c.1830-1900). Following the traditions of Realist painting pioneered by Honore Daumier (1798-1879), Women Ironing is an unsentimental snapshot of the Parisian working class: one which gives Degas ample opportunity to demonstrate his observational and painterly talents. With consummate skill Degas catches the fleeting moment, although it is certain that great deal of preparatory sketching lies behind the seemingly spontaneous result - as he once admitted, "no art was ever less spontaneous than mine". The first washerwoman, a great, strapping wench, is yawning and stretching, with one hand holding her head, and her other, a bottle of wine. In front of her there is neither washing nor iron. She is obviously exhausted and overwhelmed by the heat. Her companion wearily continues at her task. The gestures are marvellously observed. Never has a yawn appeared more natural; never has an iron been pressed downwards with such verisimilitude; and the contrast between the upraised motion of the first woman and the downward motion of her colleague heightens the effect of each. The realist impact is further enhanced by the grainy, unprepared canvas, while the colour, delightful as it is, does not prettify the working women beyond credulity. Furthermore, Degas has brushed on the crumbling touches of pastel in a way which keeps an edge of roughness by allowing the raw canvas to show through, and so makes the pastel colours vibrate. By 1884, the Impressionist group was beginning to disperse. Manet was already dead, Monet (1840-1926) had moved to Giverny, Sisley (1839-99) to Fontainebleau, and Pissarro (1830-1903) to Eragny. Renoir was here and there. Meantime, Degas continued working in Paris, producing some of his greatest genre paintings, and a range of stunningly colourful pastel drawings of dancers and other figures. In 1886, he exhibited an impressive series of figure paintings of women at their toilette, which Renoir described as "a piece of the Parthenon" - alluding to the Greek sculpture widely acknowledged to be the leading art of classical antiquity. NOTE: For the story behind French Impressionism and the group of Parisian artists who created it, see our 10-part series, beginning: Impressionism: Origins, Influences.  El Jaleo (1882) by John Singer Sargent.